On Friday, the 12th of October 2018, the ‘Kulturnatten’ – Danish for Culture Night – was hosted all over Copenhagen. Various institutions and locations opened their doors for families during the evening to present a part of their work and so did the IT University. The atrium was turned into a huge fair where different researchers and teams could present and exhibit parts as well as interactive applications of their work. The ETHOSLab hosted two activities as contribution to Kulturnatten: Deletion Poetry and a Music Chatbot. 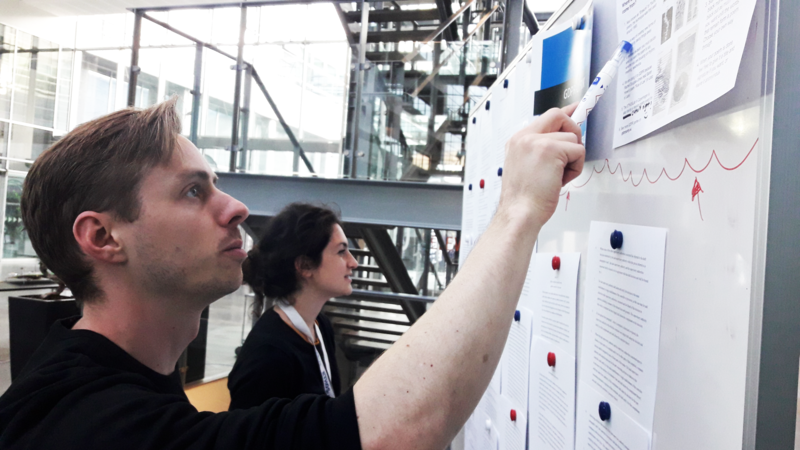 Replicating the idea from a former event of ETHOSLab, we hung pages of the GDPR legislation paper on the two sides of a huge whiteboard and invited the guests to make poetry by eliminating words from the text – the leftovers would make their work of art: Deletion Poetry! In deletion poetry, there are no particular rules; you could delete word groups, or deliberately leave them in, create graphic shapes over the text by painting over vast areas, or follow a rhythmic pattern. We also printed instructions for the procedure and made a sample version – to get a feeling for the method and as inspiration for participants who have never heard of Deletion Poetry before. The second attraction was a Music Chatbot installed by Bertil Ipsen, ETHOSLab assistant, with which one could interact and which would not only respond in words but would play music (rather sounds, sometimes quite psychedelic) according to the mood of the conversation. The installation consisted of headphones, a keyboard and two screens; one of them showed and enabled the chat, and the other displayed the synthesizer and its parameters which were responsible for producing the sound. While the participation of IT University in Kulturnatten can be interpreted as a form of science communication in itself – a university making the decision to take part in an open house event, associated with culture and mainly for families – the event also holds interesting potential to reflect on it from an STS perspective. Communication within the PUS framework relies largely on a ‘deficit model’, which evolved with the establishment of physics as a field in the first decades of the 19th century, accompanied by the conviction that science is too complicated for the general public (Bucchi, 2008). It portrays the public as ‘passive, whose default ignorance and hostility to science can be counteracted by appropriate injection of science communication’ (ibid. p. 58). Accordingly, the way of communicating, based on the deficit model and also encoded in PUS, is one-sided and top-down, from scientists to the public, and it entails the idea that if the public would only understand science, they would stop criticizing and resisting it. Jasanoff (2007) addresses the underlying conception of the public by describing PUS as ‘a theory that presumes ignorant publics are in need of rescue by the state and grants science, a privileged place in forming, and informing, an educated citizenry’ (p. 252). PUS is not only a baseline which has shaped understandings of how to make science accessible to the public and which alternative approaches are contrasted against today. In fact, the model has been criticized, particularly for its limited view of the public. Shifting away from this viewpoint, claims for a more two-sided way of communication, public engagement, democratic decision making and participation in science and science governance have become more and more popular and recognized, and are for example encoded in such frameworks as Responsible Research and Innovation (RRI) in Europe. Wilsdon and Willis (2004) illustrate the transformation from PUS towards dialogue and public engagement within the last years, and even though PUS is still implicitly or explicitly present in science communication (Bucchi, 2008), such events as Kulturnatten provide an interesting site for experiencing different and more interactive modes of science communication. Kulturnatten is targeted at a general audience, and the choice and design of the exhibition pieces seemed to be particularly influenced by families as visitors. Children could visit a magic show and craft sculptures out of computer scrap parts, and many of the other attractions such as playing with interactive lights or solving a Harry Potter or Star Wars quiz were just as entertaining for grown-ups. During my strolls around the atrium, I noticed that extensive text-based information or explanation of the exhibited material was missing – instead of transmitting scientific research by words or graphics, the motto appeared to be “do it yourself”. Science was not necessarily communicated in a traditional way, but it was created through the way in which the visitors engaged with the presented items, experiencing the potential of science and technology in an interactive, catchy and entertaining way. Also, it was always possible to talk to the researchers at the stands to find out more about the context and underlying ideas of the material presented. Some of the installations caught attention by having light or sound effects. Receiving feedback through the pieces encouraged engagement and interaction with the parameters to create different outputs. Thereby, some installations allowed the user to make own empirical investigations and create own ‘data’; for example in the case of the ETHOSLab exhibits, to create unique works of poetry or a conversation from which the chatbot algorithm would learn and which it would later pick up on. Such engagement shows that communication in its traditional asymmetrical way of transmitting information is not the only available mode of creating new knowledge about science and technology. In fact, this would probably have been quite boring for families who seeked out for an entertaining and engaging event on a Friday evening. Regarding the two activities at the ETHOSLab stand, it seemed that the more senses an attraction appealed to, and the more natural and intuitive a task, the more interesting it was for the guests. The chatbot was very popular, because it required nothing else than chatting as we do it in our daily lives, with the fascinating aspect that it is in fact an AI one is talking to, allowing for a completely different experience. The visualization of the sound-producing synthesizer on a separate screen made the mechanisms behind it more tangible and encouraged the guests to approach us to learn more about its background. The possibility to share the (chatbot) experience played an important role: Visitors, waiting in line to talk to the chatbot, read the screen and the conversation that was currently going on – they connected over it and engaged in meta discourse. This effect increased, when we played the sounds over speakers instead of headphones. The music was not always pleasant, but it drew attention of walkers-bys towards our installation and let people share their experience. I believe the greatest achievement of ITU’s participation in Kulturnatten is not to communicate science and technology towards an audience (it definitely might though, when engaging with the scientists and learning more about the background), but to make the audience communicate about science and technology – to touch, challenge, discuss it. Particularly from an STS perspective, such events can be very fruitful as they create awareness for the role of science and technology in our lives. Beyond that, they can form an interest and a position (or maybe even only a feeling) towards technological achievements, which then can become tools in a two-sided discourse with and about science and technology or – in case of visiting children – inspire career choices. The guests approaching our stand differed in their knowledge and experience with technology – some were professionals, others might pursue it as a secret passion, and again others were exposed to a chatbot for the very first time. But no matter the previous knowledge, the event figured as an invitation for everyone to make their own experiences with the exhibited items and concepts. While some of these encounters certainly revolved around communicating ‘facts’, it was especially the immediate emotional reactions to the exhibited pieces that I found inspiring, because they encourage us to think about science and technology in new modes, and because they highlight the many and multifaceted forms of knowledge and experience that can be made with science and technology beyond the passive reception of information. A view from the second floor at a not-so-busy later time that evening. Bucchi, M. (2008). Of deficits, deviations and dialogues: theories of public communication of science. In M. Bucchi & B. Trench (2008): Handbook of public communication of science and technology. Routledge: Oxon. Jasanoff, S. (2007). Designs on Nature. Princeton University Press: Princeton and Oxford. Wilsdon, J. & Willis, R. (2004). See-through Science. Why public engagement needs to move upstream. Demos: London.